Chery Boehm shares how it is important for women to pay attention to the care of their souls while leading others. 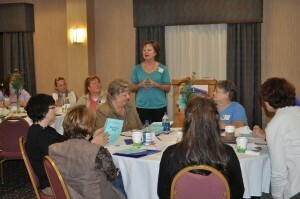 Nearly 40 women are gathered this weekend at a Hampton Inn in North Canton, Ohio, participating in the annual Women of GraceUSA Leadership Summit. They have come from around the globe to seek God in the crucible of ministry. Led by Chery Boehm, sessions focus on being aware of your needs as you lead, keeping your soul while learning to live within limits both personally and in community, and the spiritual rhythms of life (especially in leadership). Much of the discussion is based on the book, Strengthening the Soul of Your Leadership — Seeking God in the Crucible of Ministry by Ruth Haley Barton. 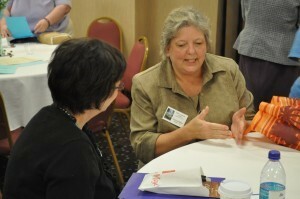 Connecting with other women who lead ministries is part of the Summit. Throughout the weekend, there have been opportunities to worship God, to pray together, and encourage one another. On Saturday afternoon, the women enjoyed free time to spend with God, either alone or in prayer with others, to walk in a local park, or to enjoy the fellowship of other Summit participants.